One of my favorite ways to wrap a present at Christmas, is to use a Christmas ornament as a bow. What’s an even better idea is to use a handmade Christmas ornament, like these clay candy cane gift tags. Using polymer clay, it’s pretty easy to make a candy cane like strand and to shape it into cursive words. You don’t have to paint any colors for this project. You just have to roll out thin rolls of red and white clay, and twist them together. Then roll the new tube flat, smooth, and even, and shape it into a cursive word. Bake your words in the oven according to the instructions on your package of polymer clay, let it cool, and paint on a thin coat of gloss. If you’re new to working with polymer clay, this is a great project for beginners. You can also check out this post I wrote a while ago: Polymer Clay for Beginners. I spelled out joy and noel, but there are a lot of fun gift tags/ornaments you could make. 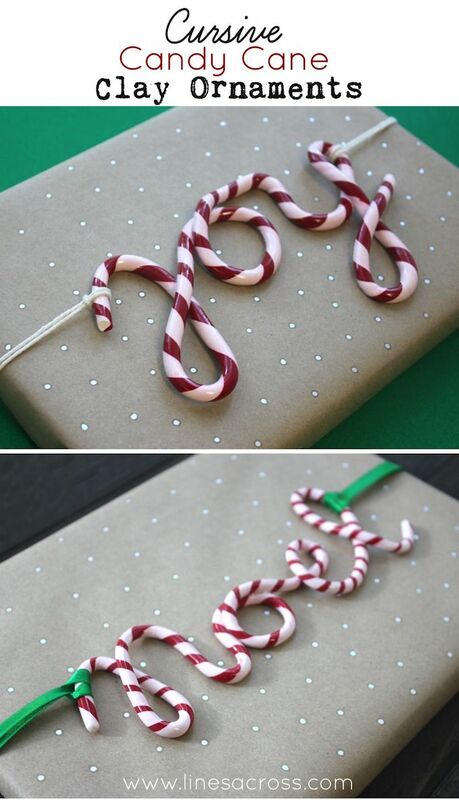 It would be really special to spell out someone’s name and use it as a gift tag on a present. The gift tag itself would then double as a gorgeous personalized ornament. What a wonderful handmade keepsake.